You need someone to read out loud for you . Your kids aren’t interested, and your spouse is busy. You know you need some help. What do you do? 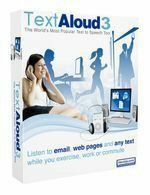 I use a program called TextAloud. You can buy it for $30, and it’s about the most useful tool I’ve got. It attaches itself to Microsoft Word, Firefox and Internet Explorer. Then it sits there and waits for you to tell it to read the text aloud to you. I have it read back my work to me as I write in WriteWayPro. I just drag the text over to the TextAloud window. I’m a member of a crit group. I drag the text from the crits I receive into TextAloud so I can pace myself through the text as I critique. Hearing the text read makes a huge difference. Save time and get more done by listening while you exercise or do other work. Record mp3 files, chapter by chapter, of your work-in-progress. Listen to them in the car during your commute. Helps improve reading and comprehension by listening to text while viewing it. When so many software tools are very, very expensive, I’m happy I found one so reasonably priced, that does the job so well. I’m not affiliated with NextUp, the makers of TextAloud. I am simply, purely, a happy user. I also happen to be a software developer myself, so I know a good tool when I see it.